Ok! Let’s face it!! When it comes to office wear, women have the luxury of a lots of options to choose from, as compared to men. And more the options.. the more you buy. So much so, that by now your wardrobe is flooded with irrelevant clothes. Remember! how recently you went through your wardrobe full of clothes, but could not find anything substantial to wear for your office meet. So, we are here to save you from making the same mistakes of buying irrelevant clothes for office wear. And when it comes to formal wear for Indian women, there is no attire like the evergreen SAREE. 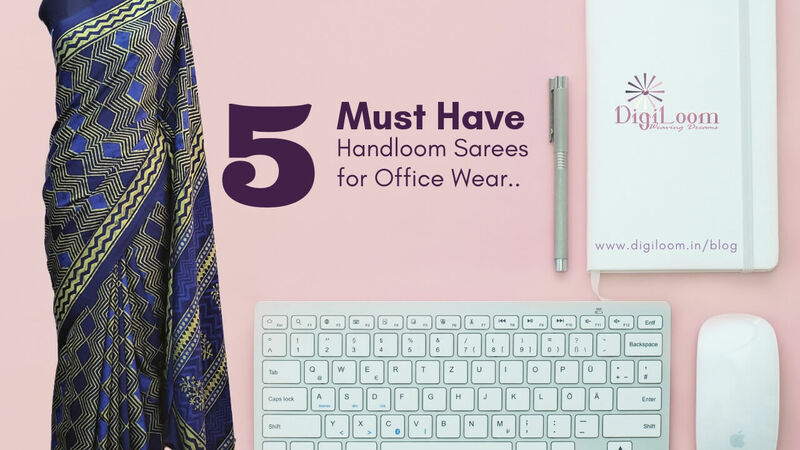 For your benefit we have further narrowed it down to 5 must have handloom sarees for office wear.. Right attitude combined with the right attire, can take you places in your professional endeavors. While selecting the clothes for your office wear it is very important to understand your office culture and overall vibe of your company. For example, wearing power suit in a fashion startup company might be deemed as ‘overdressing’. On the other hand, in a highly corporate environment even a good dark blue jeans might be considered as ‘too laid back’. When it comes to workwear, no doubt you have to keep it very professional. But adding a bit of your individuality won’t harm your overall look. Rather, it helps you in adding your personality to your office wardrobe. For example, if you are a positive and energetic woman who likes vibrant colours, you can always add a dash of vibrancy in your mundane office outfit. The key here is not to get overboard. This way people can see your vibrant positive personality without you compromising on office wear decorum. This one is crucial. It can either make or break your overall office look. When buying an outfit for work, mostly women opt for the latest trend. This is a huge mistake. For office or formal wear you should always go for classic look. So what is the difference between trendy outfit and classic outfit? The difference is trendy outfit is what is in fashion at the time of you buying the outfit and classic outfits are timeless. It never goes out of fashion. It has a certain amount of subtleness to it. Classic outfit also helps you transit effortlessly from your boardroom meeting in the afternoon to an official dinner at night. This is a no brainer. Your office wear should be comfortable and soothing to you and skin. Afterall, you spend good 6-8 hours (and more) of your day wearing it. You will not be able to perform well in that sweaty and itchy polyester top in summer. When it comes to creating a classic look, that adds you your personality without compromising on the comfort, Handloom Sarees are the best bet. Tussar silk is considered extremely rich and luminous in texture. Tussar is highly porous and possess cooling effects and breathability. Hence it is very soothing to the body and can be worn during summer and humid season as well. And with digital prints on it, this makes a perfect choice as formal and office wear. From being a symbol of the Indian freedom movement to providing employment to thousands and thousands of weavers, KHADI has always been a fabric with attitude. Wearing Khadi means making a strong positive fashion statement. It shows you care for sustainable lifestyle and believes in empowering the society. Reason enough to add Khadi Saree in you must have office wear list. Handloom Cotton Sarees are primarily rich in texture and soft to feel. Cotton Sarees are known for its minimalist yet tasteful look. 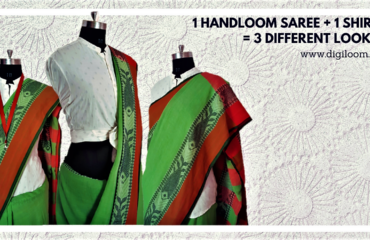 This is one of the many reasons why handloom cotton sarees are one of the best option for workwear. Linen is essentially a lightweight fabric, known for its versatile appeal. Linen Sarees are extremely soft and it breaths, making it a perfect natural sartorial choice for Indian summer. And it adds an impeccable freshness to your entire look while you step out of your homes everyday for work. Jute Silk Sarees are made after many steps of smothering fibres of jute, mixed with the silk yarns which are woven together into a full sarees The properties of pure Jute fabric such as its strength, coarseness, roughness and thickness make it a great raw material for making stylish saree that are easy to carry and affordable. These sarees are best for daily office wear as it looks really rich but actually very affordable and low in maintenance. 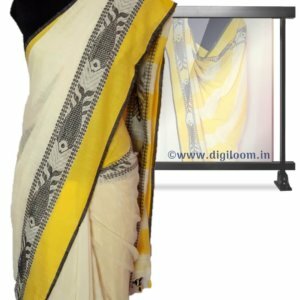 CLICK HERE for more Office Wear Handloom Sarees..
Do you have your list of must have Handloom Sarees for office wear? Share with us on the COMMENT section below..
Nice saree ideas for office goers. Fashion and also a comfortable one. Thank You Polash and it is wonderful to see you working for Khadi. Keep up the good work..